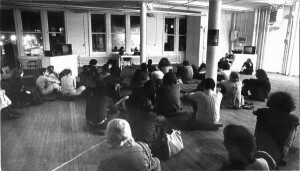 Audience gathered at Artist Space for a poetry reading by Jennifer Bartlett, April 24, 1974. What do we mean by Alternative Art Economies? And what are we looking to find an alternative to? The semantic ambiguities that plague the terms autonomy, community, and democracy, also plague the term alternative. Within an art making context, the application of the term alternative can be read as redundant; as the path of an artist is often already perceived as an alternative to a traditional nine to five job. In various sessions we will try to identify possible alternatives to the legacy economic structures and traditional work models that have been built around art making. What is the purpose of alternative economies in our society and world today and the significance of having these alternatives as we move into the future? Perhaps a re-examination of the history of alternative and traditional models –participants, processes, and outcomes –can form the basis. 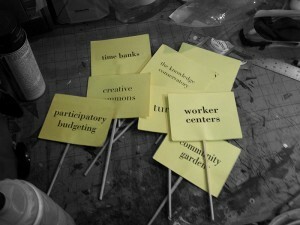 From there can we do a closer examination of new alternative economies in the arts, post-occupy wall street. We don’t have the answers, and while our working group has been focusing on this issue for some time and many people have worked along these lines in the past, we call on others to collaborate and build out this course and the following sessions. We are open to exploring this subject through collective and collaborative readings, interviews, walks, field trips, picnics, films and other ideas the group might have. What do we mean by Alternative Art Economies? And what are we looking to find an alternative to? *Rain location at Think Coffee, 248 Mercer St. In this second session of Alternative Economie’s (a working group of Arts & Labor) summer series, we will discuss the history of Art Worker Formations (Unions, Guilds & Cooperatives), discuss labor in the culture industry – including past and present collectivization, and consider the common needs of an art worker in the United States and the viability of forming a union to address those needs. 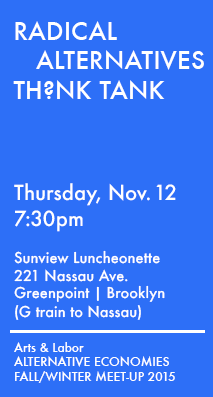 4-5:40 p.m. – The Base, 1302 Myrtle Ave at Stockholm St, Brooklyn, NY.